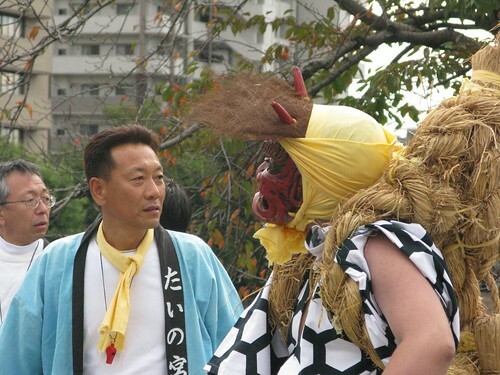 [At the shrine] there were lots of drunk tattooed dudes clad in special clothing bound in rice stalk ropes and demon masks. These guys came in and claimed the temple (in search of protection so it seemed from a young demon-slaying god played by a Extremely young boy who did a ceremonial dance with a short sword and a massive flowery harvest hat). To drive the demons out fo the temple in order to be able to appropriately celebrate the harvest, boys and males in blue jackets rushed the temple methods about ten instances with a giant battering ram also produced of dried bound rice stalks and cedar logs. The drunk demon guys, in among throwing up thru their masks and taunting us in Genuinely RUDE Japanese, and even jumping up on the battering ram occasionally, would take turns singling out townsfolk and ganging up on them (truly fighting with them, and of course, trying to repel the battering ram attacks with sticks of their personal. It was bascially a massive drunken rugby scrum with cedar sticks on the actions of the shrine. The old guys kept giving me sake and urging me to support their boys defeat the demons– so I lastly handed my camera to an individual I had been talking to on the sidelines and jumped in for the final handful of rushes, when we lastly overcame the demons, did a dance, tried to stay away from the puddles of vomit on the shrine floor, and went property.